TVS Apache RTR 160 4V ABS Prices Revealed! The prices of TVS Apache RTR 160 4V ABS have been revealed. It is priced starting from Rs 92,645 (ex-showroom) and will be reaching dealerships soon. Ahead of the upcoming safety regulations from April 2019, TVS has updated the Apache RTR 160 4V with ABS. Prices start from Rs 92,645 to Rs 98,644 (ex-showroom Chennia), for all the variants. The ABS variants are priced Rs 7,000 more than the non-ABS variants. The non-Abs variants are priced starting from Rs 86,145 to Rs 93,145 (ex-showroom prices Chennai). 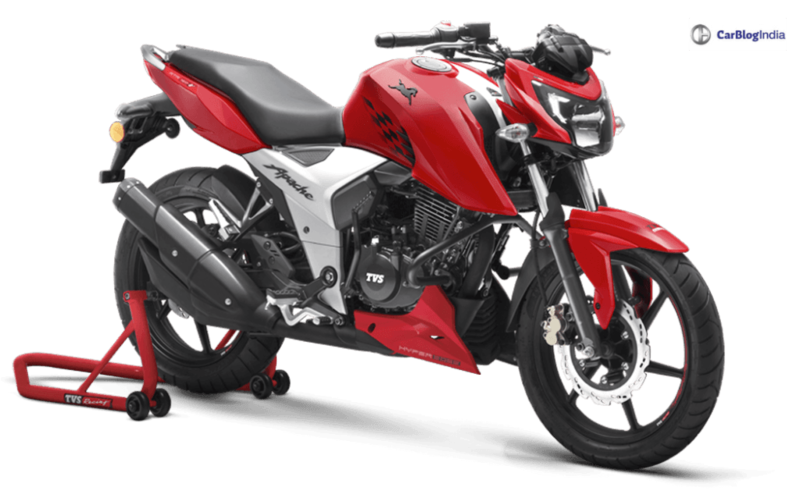 TVS Apache RTR 160 4V is now available with a single-channel ABS. Rest of the bikes in this segment too are equipped with a single-channel ABS. RTR 160 4V is available in three variants – EFI, Carb Dual Disc, Carb Single Disc. Other than the inclusion of ABS, there are no changes on Apache RTR 160 4V. It continues with the same 159.7cc oil-cooled 4-valve engine that puts out 16.2 BHP and 14.8 Nm of peak torque. The engine comes mated to a 5-speed gearbox. Features onboard include a double barrel exhaust, EFI, LED position lamps, fully digital instrument cluster, racing seat, Racing tires from Remora and rear tire hugger. The cluster displays information such as lap timer, top speed recorder and more. For suspension purposes, it uses telescopic forks at the front and SHOWA monoshock suspension at the back. Braking is handled by a front disc as standard and rear disc as optional along with ABS. The bike is available in three colour options – RR Red, Racing Black and Racing Blue. At this price, Apache RTR 160 4V is the costliest ABS equipped motorcycle. However, the Carburetor variants might be lower than Yamaha FZ V3 and Honda CB Hornet. FZ V3 goes for Rs 95,000 and CB Hornet for Rs 92,000. The regular RTR 160 is also left to be updated with ABS. In November 2018, TVS updated the Apache RTR 180 with dual-channel ABS and a new instrument cluster. RTR 160 will get a single-channel ABS. Apache RTR 160 is actually one of the best selling motorcycles in its 150-160cc naked-sports commuter segment. For the month of December 2018, it made around 26,338 units.